Roberto Rodriguez is feeling proud. He's doing his part to complete the largest infrastructure project underway in the United States, the I-4 Ultimate Improvement Project, a $2.3 billion Public-Private Partnership (P3) project to redesign and reconstruct one of Florida's most vital highway systems. Rodriguez has worked on job sites all around Florida, Texas and his home country, Puerto Rico. As an excavator operator, he has used machines made by several of the world's leading construction equipment companies, but the Volvo he's been using since June, the ECR305CL, offers the features that are most relevant and important to his work. I have three kids. One day I will tell them the story about how I was involved in the construction of Interstate 4 and the sense of pride that goes along with it. The features of the ECR305CL are indeed impressive: the Volvo ECR305CL is a 38-ton capacity crawler excavator. It's equipped with a 204 hp Volvo D7 engine and 36,580 lbs. of bucket-digging force. It can lift 12 tons and dig down 22 ft. 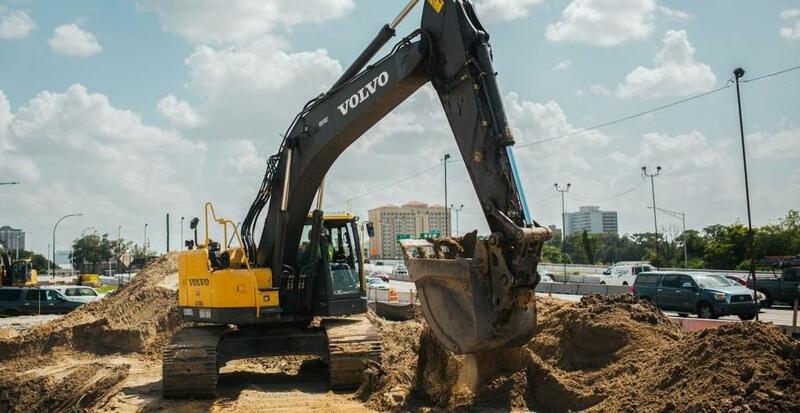 The machine, along with the other 70 Volvo excavators and compactors on the I-4 Ultimate Improvement Project, is a crucial tool in constructing the 21 mi. of highway, 140 bridges, 15 interchanges and nine toll gantries that compose the massive undertaking. Alvaro Alonso, design-build manager for SGL Constructors — the joint venture of Skanska, Granite and Lane that is leading the project's construction — said that choosing quality construction equipment is one of the keys to its success.